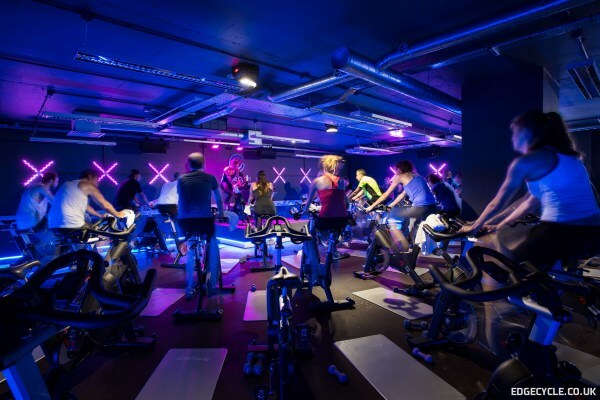 In the heart of Fitzrovia, Psycle is undoubtedly the “cool kid” of cycling – appealing to artists, writers and creatives from nearby agencies and publishing houses. 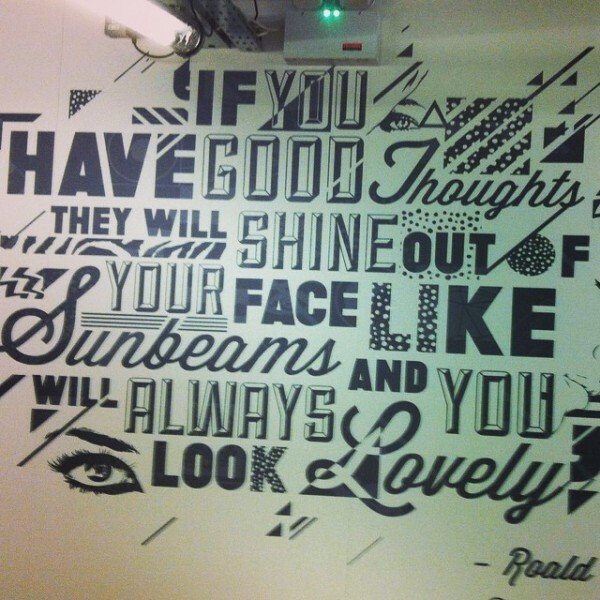 Pristine white walls and inspirational wall graphics – plus, of course, motivational messages as you ascend the stairs – tick all the boxes for a premium London fitness studio. At reception you are given a pair of cleats for the class, free of charge. These clip-in shoes remove the need for fiddly foot straps and promote full muscle engagement from your quads and hamstrings as you pull and push the peddles around (read: lean, balanced legs rather than bulging thighs). 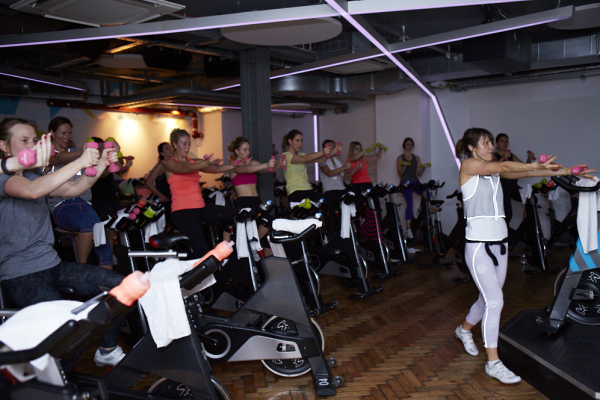 Downstairs in the studio, the concrete walls and floor with disco lights overhead set the tone for an energetic workout. 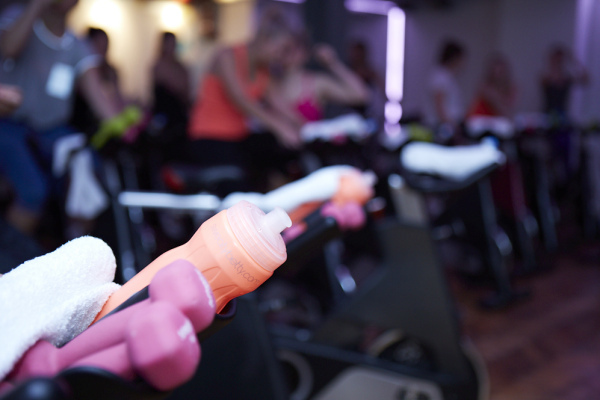 You start the class like any other spin class, with a slow warm-up building up into sprints and climbs. Then come the press-ups. Psycle demands a bit of coordination as you perform narrow, wide and single-arm press ups – all to the exacting beat of the music. Get the groove just right and the resulting adrenaline buzz is better than a night on the tiles. The penultimate track of the session typically entails upper body conditioning. Here you grab a set of light dumbbells and punch, curl, extend, rotate and pulse them for a comprehensive upper body workout that is 100% on the bike. Again, you’ll need to switch your brain on because the music sets the rhythm for both your feet and your hands, and you don’t want to look out of step. For me, this was a huge pro rather than a con. I loved how immersive the Psycle experience was, and the fact that my mind never once wandered during the 45 minute session. Finally, the changing rooms at Psycle are among the best of any London studio. They’re clean, there are several showers – stocked with luxurious Ila shampoo, conditioner and body wash – and plenty of space to spread out as you blow dry your hair and do your make-up. To me, the post-workout experience is almost as important as the workout itself, and I felt right at home getting ready for the day ahead after an energising early morning spin order viagra online usa. 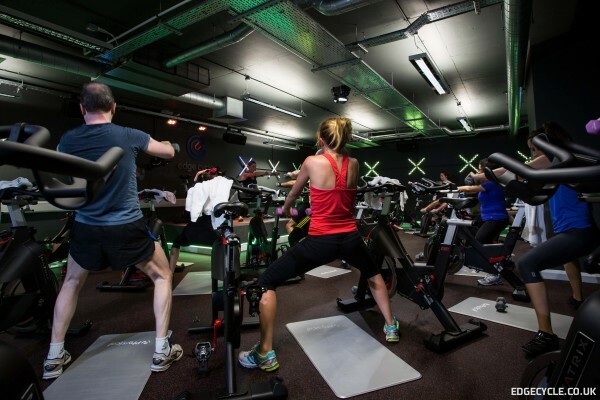 Edge Cycle in Farringdon rises to the needs of its surrounding city workers, squeezing a full-body workout into it’s time-effective on-the-bike, off-the-bike bootcamp. There are traditional spin classes and mixed conditioning classes on the schedule, so you can vary your workouts throughout the week. While cleats are available at reception, I did the bootcamp class in trainers for smoother transitions between the cycle legs and conditioning legs. As a converted office, the studio is surprisingly edgy and lives up to its namesake. Riders look onto solid black backdrop with built-in disco lights, which alternate with overhead spotlights. The music is high-energy to match the dynamic lighting system, but the ride itself is not performed in sync to the beat. While this means less coordination is required of you, it can also mean the high-intensity intervals feel like more of a slog. During my class, we went right into some pretty heart rate boosting segments from the word go, so I’d recommend arriving a few minutes early to spin out your legs and warm up your body beforehand. I enjoyed the off-bike segment. There were combination exercises combining squats with upper body movements to keep the intensity levels high. Plus, there was great balance throughout the conditioning – without the constraints of the bike, it was much easier to work opposing muscle groups. Press-ups were followed by plank rows and reverse lunges were paired with squat clean and presses. Then, to burn through the last of your energy stores, the conditioning is sandwiched by a final Tabata-style spin track at the end. Expect short but sharp intervals across two or three minutes, so you’re short of breath again by cool down. Although you definitely shouldn’t skip the stretch, you’ll want to be quick to the changing rooms. There are five open-cubicle showers so prepare for a little less privacy than you might be used to – and bring your own shampoo and conditioner as the only cleanser provided is Ren bodywash. There is also only one small mirror with two hairdryers, so if you’re in a rush to get ready for work or an evening out, you should have a personal mirror to hand. Or save your workout for the end of the day and shower at home. To summarise, there are pros to working out at both Psycle and Edge Cycle. While it would be a lie to draw parallels with Shakira, I love escaping into the Psycle dance fantasy and imagining I look every bit as good. And for me, its sensational showers give it the edge.